It was a race to the finish for Southern Comfort, who captured top honors at the 30th Annual Treasure Cay Billfish Tournament (TCBT), June 2-7 at Treasure Cay Beach, Marina & Golf Resort, Abaco, Bahamas. Owned by Peter Angel, Ft. Lauderdale, FL, Southern Comfort clinched First Place on the last day of fishing when they released their fourth blue marlin, bumping Domarlo, owned by Doug Macdonald, West Palm Beach, FL to second place. Southern Comfort earned Top Team and Top Release Team, releasing a blue marlin on each of the four fishing days. Peter Angel released two blues to win the Top Angler trophy. Domarlo claimed the Ultra Champ award for most points earned by prior TCBT winners. The teamcelebrated a Grand Slam on the first day of the tournament, with a blue marlin and sailfish double-header, followed by a white marlin release. Their honors included Top Dolphin for a 29.7 lb. fish plus Top Lady and Second Place Angler awarded to Heather Macdonald. Big T’s Too owned by Bob Wolsey, Sarasota, FL dashed from zero to 800 points on the last day of fishing with a blue and white marlin release to snag Third Place. Top Junior Angler went to fourteen-year-old Mason Daughterty, Auburn, OH on Pandemonium, owned by Kim Kuhnle, Treasure Cay, Bahamas. 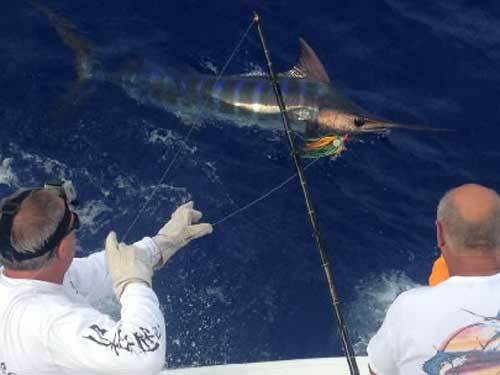 Kilowett, owned by Eddie and Lisa Flack, Ft. Lauderdale, FL caught the first blue marlin of the tournament, earning Third Place Angler for Lisa Flack. A total of fourteen billfish were released during the four days of fishing by eight competitors. For the lay day Kettle O’Fish tournament Big T’s Too took First Place Bottom Fish Division with twenty snapper. Pandemonium took First Place Lionfish Division with seventy fish. Social events included crab races and a lay day dock party with delicious dishes prepared by the anglers. To commemorate the tournament’s 30th Anniversary, an incredible sandcastle was sculpted and lighted on the lay day by Victor Leong. IGFA Offshore World Championship. Sponsors included Rubis Bahamas, Ltd, Silver Airways and Treasure Cay Beach, Marina and Golf Resort. Co-sponsor/official weather provider was Weather Routing, Inc.
Treasure Cay Beach Marina & Golf Resort offers 78 harbour side hotel rooms, including one, two or three bedroom suites, a 150-slip marina, a 3 1/2-mile powdery white sand beach, an 18-hole golf course, four tennis courts, a swimming pool, Spinnaker Restaurant, Tipsy Seagull Bar, Coco Beach Bar, reception center and a beach gazebo available for sea-side weddings and other functions. Not only does Treasure Cay offer fabulous offshore fishing, the area is a famous destination for world class bonefishing.